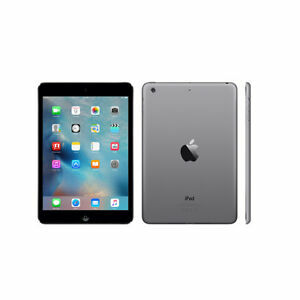 Students will appreciate how this Apple iPad mini 2 ME276LL tablet allows them to stay connected to family, take notes in class, or search the Internet for information for a school project. Keep favorite movies, photos, songs and games accessible with the tablet's ample 16 GB hard drive capacity. For work or play, this tablet has millions of unique apps available with the sophisticated Apple iOS operating system. It's possible to view a selection of digital material with ease and comfort thanks to the tablet's handy 7.9 in / 20.1 cm screen size. Users wanting a great experience and screen clarity will appreciate this tablet's high screen resolution of 2048 x 1536. Equipped with a convenient front camera, this tablet allows users to capture more background details when taking selfies, and to enjoy video chats with friends and family around the world. Find out just what this tablet is capable of by connecting to the Internet anywhere with its easily accessible Wi-Fi connectivity. Immediate payment of US $499.99 is required.